Jim Schwab Consulting LLC is a one-person firm with a modest mission and a relatively brief history. Its expertise, however, is built on Jim Schwab’s innovative, highly regarded 31-year affiliation with the American Planning Association, which ended May 31, 2017, when Jim chose to work independently with the freedom to spend more time on writing and volunteer work in addition to paid consulting projects. That employment, which ended with his nine-year tenure as manager of the APA Hazards Planning Center, is highlighted on this site’s Professional Background page. Jim Schwab Consulting LLC now undertakes consulting assignments where Jim’s expertise can play a critical role in advancing the field of planning for natural hazards, usually by enhancing the resources available to professional planners and allied professionals for dealing with hazard-related challenges, or by using current planning practice to enlarge the scope of such planning for coming generations of planners. In the spirit of sustained creativity, what that mission means is something worked out with prospective clients on a case-by-case basis. Jim is not interested in the quantity of such projects, but in their quality. He wants to expand the mark he has already left on the field of urban planning. If you have a proposal for consideration, contact Principal James C. Schwab, FAICP, at jimschwabfaicp@outlook.com. Sustainable City Network will host a 4-hour online course Aug. 21 and 22 for anyone responsible for initiatives related to resilience and disaster recovery planning. In the first 2-hour session, we’ll review the overall concept of recovery planning and the need for widespread involvement by various sectors of the community. The second segment will walk participants through information gathering, assessing the scale and spectrum of the disaster, and how to involve the public in meaningful long-term recovery planning. Instructor James Schwab, FAICP, is a planning consultant, public speaker and author who has taught since 2008 as adjunct assistant professor in the University of Iowa School of Urban and Regional Planning, with a master’s course on “Planning for Disaster Mitigation and Recovery.” Attend live or via on-demand video. Cost is $286 when purchased by Aug. 3. In November 2017, Jim undertook an assignment with the National Drought Mitigation Center, part of the University of Nebraska in Lincoln, through September 2018. NDMC is seeking to build out its GIS-based online resources for communities seeking planning resources and best practices in preparing for drought. The work involves a series of specific tasks conceived by Jim and worked out with NDMC staff to achieve this goal to construct a meaningful framework for identifying and properly categorizing such resources on a nationwide basis, recognizing the variations in state programs for facilitating drought mitigation and water planning. In May 2018, Jim accepted an assignment with the Association of State Floodplain Managers (ASFPM) to lead the effort to produce a Planning Advisory Service (PAS) Report on incorporating climate resilience into local government capital improvements planning. 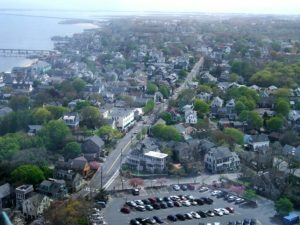 ASFPM partnered with the American Planning Association‘s Hazards Planning Center on the successful 2015 proposal to the National Oceanic and Atmospheric Administration (NOAA) under NOAA’s Coastal Resilience Grants program. PAS Reports are APA products intended to educate planners and allied professionals on various important planning topics. Jim was previously involved with this project through helping prepare the grant proposal, then as project manager for APA’s participation in the project while manager of the Hazards Planning Center, before retiring from APA in 2017. Helping APA meet the deadline for a new grant from the Federal Emergency Management Agency by successfully preparing a proposal that included work on the interrelationship between droughts and flooding, and on tracking state legislation pertaining to planning for natural hazards, climate change, and resilience. Later in the summer, that proposal was funded for approximately $275,000 over FY2018-2019. Providing on-site and other mentoring for new HPC manager Shannon Burke, who joined APA on July 5, 2017. Completing APA work on “Improving Community Resilience through Risk Modeling,” a project funded by the U.S. Department of Housing and Urban Development in cooperation with the National Oceanic and Atmospheric Administration, and led by AECOM with Digital Coast partners APA, the Association of State Floodplain Managers, and the National Association of Counties as subcontractors. 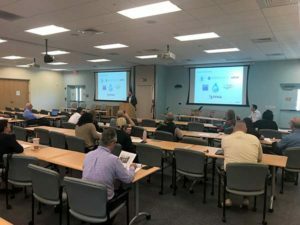 The project included direct training work with staff of two pilot communities—San Luis Obispo County, California, and Brevard County, Florida. His recent election as chair-elect of the APA Hazard Mitigation and Disaster Recovery Planning Division. This two-year role began January 1, 2018, and involves assisting new chair Allison Hardin in leading the Division and its 700-plus members in providing professional education opportunities, public service opportunities following natural disasters, and communication through APA on major disaster-related planning issues. Jim will automatically become chair of the Division in 2020 for a two-year term. 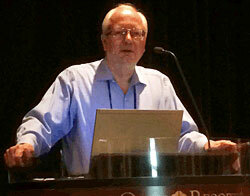 Following two speaking appearances in Texas for the Texas APA chapter in late October and early November, Jim became involved with the Hurricane Harvey Recovery task force the chapter established, which also involves representatives from FEMA’s Community Planning and Capacity Building team, Texas A&M University, local officials in affected communities, and others. As he has done since April 2013, Jim continues to produce his popular “Home of the Brave” blog, providing insights and education to readers on a range of urban planning and public policy issues, obviously including those pertaining to natural hazards and disaster recovery.